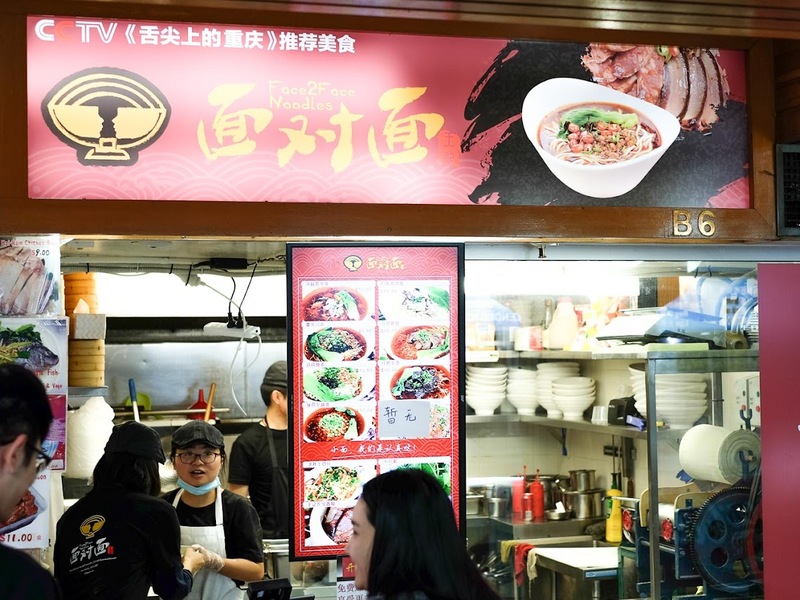 We're heading off to Chongqing later in the year so it's great to warm up on some of it's famously fiery cuisine at Face2Face Chongqing Spicy Noodles in Dixon House Foodcourt. The folks that run Face2Face certainly know what they are doing. 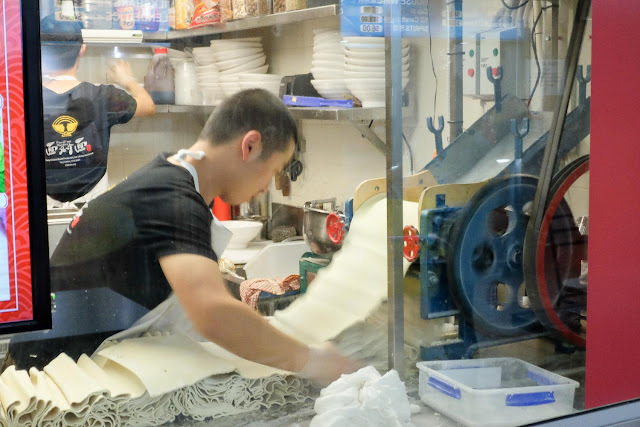 They hit the ground running with a well worked-out menu and system, the staff are super cheery and the noodles are top notch. ...then sliced ready to go. 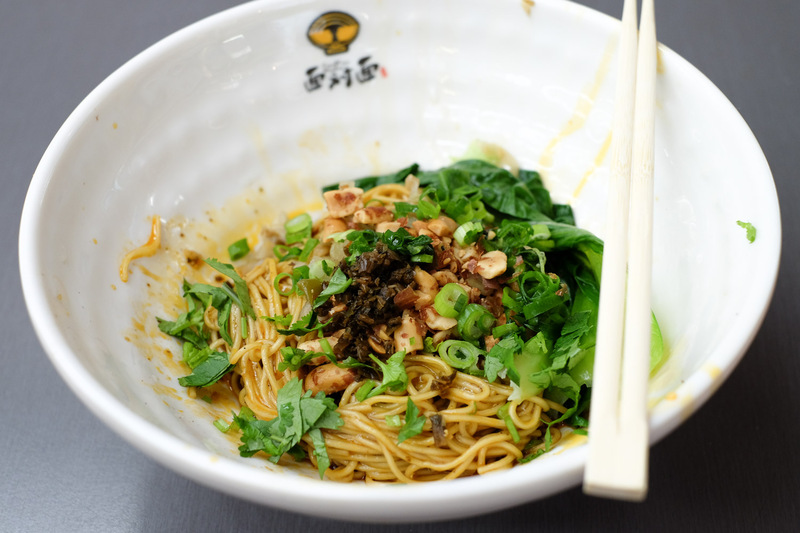 The Yibing Spicy Dry Noodle ($9.80) is our pick of the menu, the Sichuan pepper and chili is both violent and subtle, peanuts snazz up the texture and those handmade noodles are the business. We order medium-spicy and it's pretty dang fiery, we're a bit chicken to try it full spicy. Our lips were still tingling from the party-in-the-mouth Sichuan pepper half an hour later. 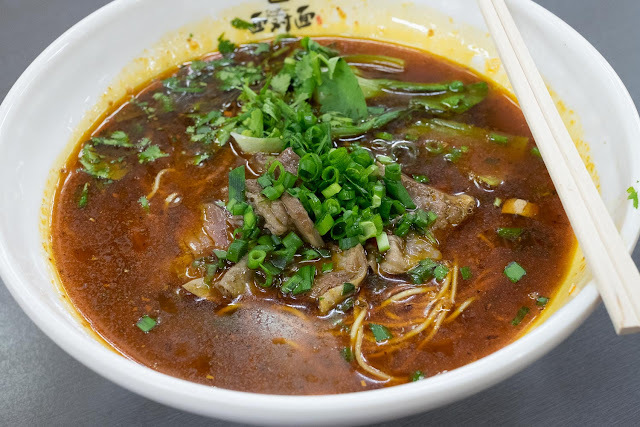 Chinese five spice pork intestines noodle soup ($10.80). If you like that poo-ish intestiney flavour then you will love this soup, the funky flavours add a solid base to pile up with chili and Sichuan pepper. Pork mince with pea noodle soup - $10.50. Another spicy soup prettied up with peas. As with all the soups here you can get a free refill on the noodles. We've always been happy with a single serve but it's nice to know it's there. 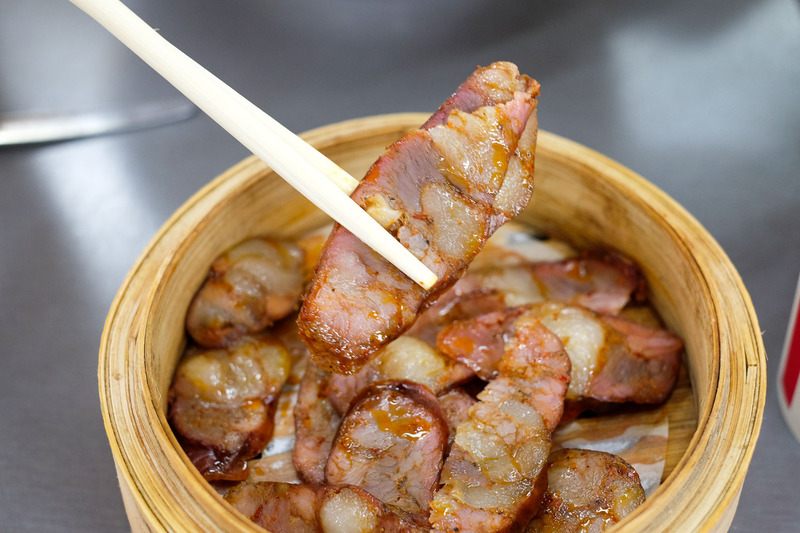 Mr Wang's spicy smoked sausage ($6.80) is a must-try, a firm meat spicy sausage that reminds us very much of chorizo. Chinese five spice beef noodle soup - $10.80. 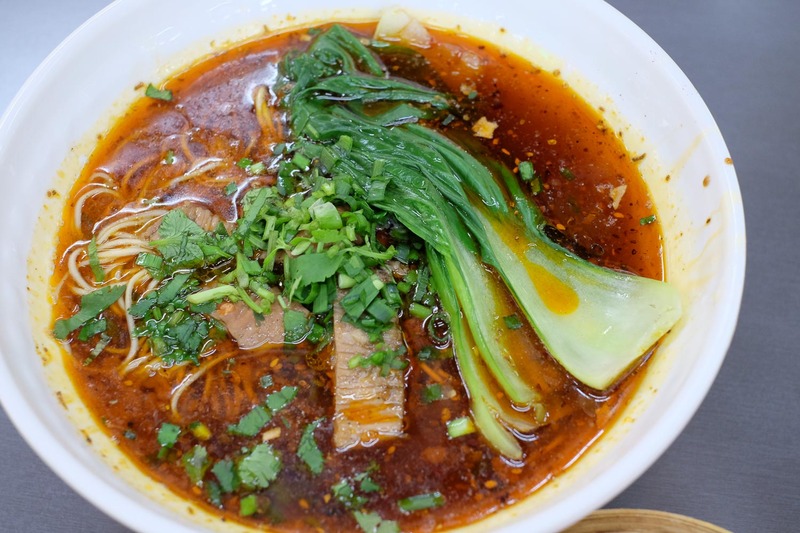 The five spice flavour is lost in the fiery broth. 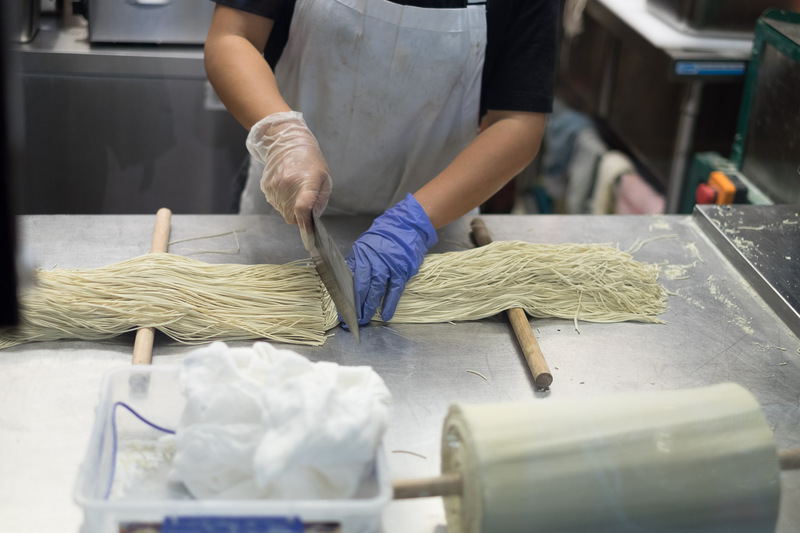 It's an oily style of broth which puts a wonderful coating on the noodles, it's not a slurping kind of broth. The beef is rich and mouth-melty tender. 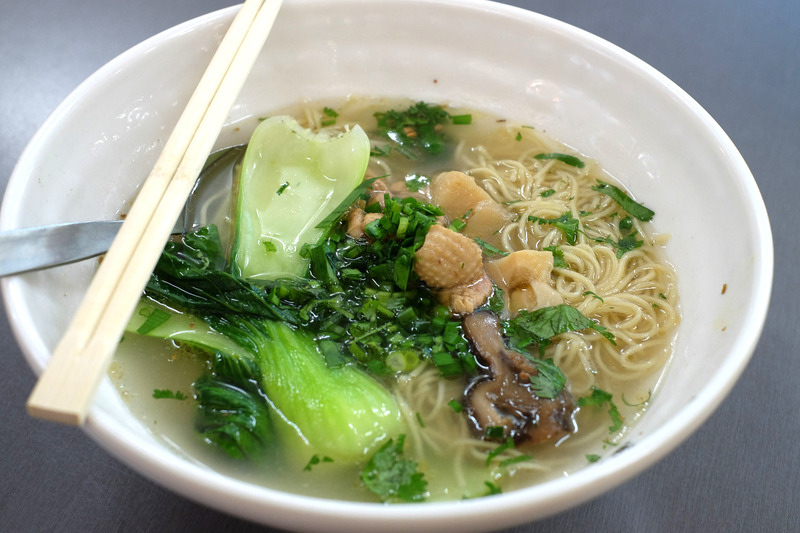 Chicken mushroom soup noodle - $10.80. 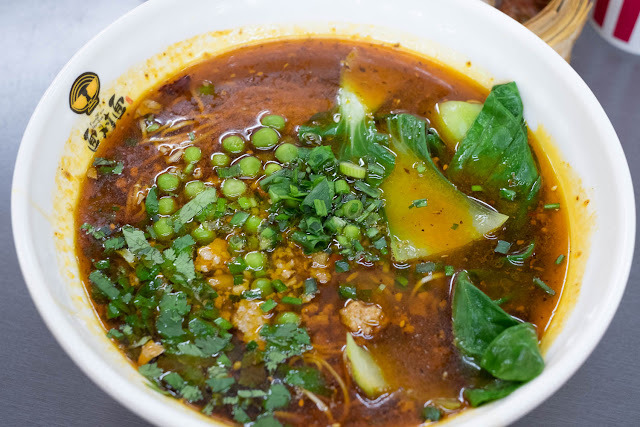 The one non-spicy soup on the menu is a winner, a clean and seemingly simple broth, we'll be back for this one when we feel like a cleansing soup. Face2Face menu is short'n'sweet so every dish is most likely a winner. Face2Face is in the glorious Dixon House Food Court, in the corner bunker of Little Hay and Dixon Streets, Haymarket/Chinatown. Ooh, can't wait to see your blog posts on Chongqing later. The name of the restaurant is Chinese is a fun play on words, 'face' is the same sound as 'mein' (noodles), so it's face2face and also noodles2noodles! Oh I see, thanks for your translation services once again Lucy! That potato salad is next on my list. Thanks for the headsup guys!! I notice another 2 stalls are goneskies - viet place and thai place. Wonder what will replace them? It's always a little exciting to think what might go in there next. I think Dixon House has picked up with these new places, let's see what new eating adventures await. these places have both been replaced! one by a (i think?) shaanxi place? anyway they have the same burger on the menu that the eating world shaanxi place has. the other place is vietnamese, looking kind of standard. i had the dry noodles today, so much sichuan pepper! my mouth was numb for about half an hour afterwards. they also had some new menu additions ... i got a pigs ear salad which wasnt offered last week? i think? I have been a regular customer of their since they opened. Unfortunately, their taste has since been altered which I'm not sure whether it's due to change of management or recipe. I just wish their old recipe can be brought back !! although taste has changed, this is still no.1 spicy noodle soup place I regularly visit. 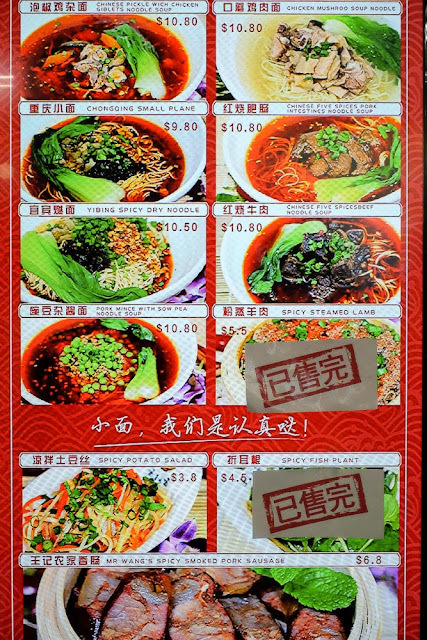 I went there yesterday - it's definitely changed hands and menu - my spicy noodles were still awesome, haven't re-tried the dry one yet.